The U.S. Government does not endorse products or manufacturers. Trademarks or manufacturer' names appear in this report only because they are considered essential to the objective of this document. 2.Government Accession No. 3.Recipient's Catalog No. The contract manager for this report was Tamara Redmon (FHWA Office of Safety). Highway Safety Research Center (UNC-HSRC) were subcontractors to VHB; Laura Sandt was the Principal Investigator from UNC-HSRC. Gabe Rousseau (FHWA), Leah Walton and Paula Bawer (NHTSA), and other USDOT staff reviewed the guide and provided valuable feedback. Authors of the original guide, A Resident's Guide for Creating Safe and Walkable Communities, upon which this guide is based, include: Laura Sandt, Robert Schneider, Dan Nabors, Libby Thomas, Colleen Mitchell, and RJ Eldridge. Credit goes to NHTSA for its contributing role in the education and enforcement section of the original guide and for funding pilot-testing of the original guide with 15 community groups across the U.S. he purpose of that testing was for community groups to assess pedestrian safety needs in their community and develop and implement educational, engineering, or enforcement projects to address those needs based on information provided in the guide. The feedback and findings from the effort contributed greatly to improving the content for this current version, including incorporating the lessons learned into useful community success stories. Images are from the Pedestrian and Bicycle Information Center Image Library (taken by Dan Burden, Ryan Snyder, Mike Cynecki, Michael Ronkin, and guide authors), the National Center for Safe Routes to School, project staff (including HSRC, Toole Design Group, and VHB), Dan Gallagher, the City of Seattle, the City of Boulder, the NC Complete Streets Planning and Design Guidelines, and the contributors credited in the community success stories. This guide is intended to assist residents, parents, community association members, and others in getting involved in making communities safer for pedestrians and bicyclists. The guide includes facts, ideas, and resources to help residents learn about traffic problems that affect pedestrians and bicyclists and to find ways to help address these problems and promote safety among all road users. The guide includes information on identifying problems, taking action to address pedestrian and bicycle concerns, finding solutions to improve safety, and resources to get additional information. Safer environments, where you are less likely to be in a traffic collision or get injured. Better access to more destinations, providing more choices in how you can get where you want to go without relying on a car. More opportunities to be physically active, which can improve your health and overall quality of life. 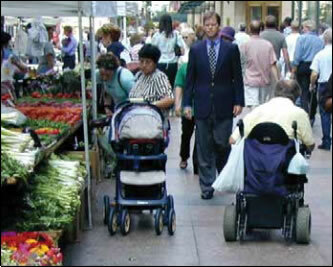 Opportunities for everyone, which includes people with disabilities. It takes the commitment and involvement of many people to build and maintain places that are safe and friendly for walking and bicycling. This guide is designed to be used by anyone looking for ways to improve the safety and comfort of their neighborhood streets, whether they are just beginning to learn about traffic safety or are already part of an established community safety or advocacy group. Residents can make a difference by raising awareness of pedestrian and bicycle safety issues and pushing for change. This guide provides examples from other communities working to improve pedestrian and bicycle safety. It includes ideas and resources to help residents learn about issues that affect walking and bicycling conditions, find ways to address or prevent these problems, and promote safety for all road users. The Resource Sheets at the end of the guide contain checklists, tip sheets, worksheets, and sample materials – these materials can be adapted to meet the needs of your community, or distributed to others working to improve pedestrian and/or bicycle safety. The guide provides an introduction to common safety issues and includes references to other resources and materials for those interested in more in-depth information. Keep in mind that pedestrian and bicycle safety improvements often happen in stages. Even minor changes take time and may require effort from various individuals or agencies. This guide is a starting point and will help you be more efficient and effective, but patience and follow-through are crucial to your success. A Resident's Quick Guide for Creating Safer Communities for Walking and Biking follows along with this guide and highlights some key activities that you and your community group can implement to help improve safety for all road users in your community. Use it as a quick reference of ideas to help you plan your role as an active participant in efforts to improve pedestrian and bicycle safety. The guide is organized into six sections to lead you through your efforts to improve safety in your community. Depending on your needs, you can start with any of the sections below. Section One: What's the problem here? This section will help you learn how to identify and document pedestrian and bicycle safety issues in your community. Section Two: Who can help me? This section provides ideas on groups and individuals that can help improve walkability or bikeability in your neighborhood and offers information on how to expand your partnerships. Section Three: What can be done? This section describes different fixes for improving traffic safety conditions in your community and how community groups can support or initiate improvements. Section Four: I need more information! This section includes important resources to help you find more detailed information on making pedestrian and bicycle safety improvements. This section includes detailed tip sheets, checklists, ways to take action, and sample materials that can be used to generate ideas and improve the walkability and bikeability of your community. To download a PDF of all the resources click HERE.